Let me begin with a question, one parroting my question ‘Why Animation, Alan?’ entitling a piece by me in the Spring 2008 Society for Animation Studies Newsletter. My question today: ‘Why my focus on art for this Toronto 2014 Society for Animation Studies conference on The Animator, Alan?’. Answer: not only because art is raised as thematic in the call for papers but because I want to contextualize and sketch for you an ostensibly new project I am undertaking: the theorizing of art as a form of animation. And why do I turn to this topic? Not least because, once again, there has been an ongoing irritant to provoke me to do so. But that is an experience I have had now over several decades, often at the rate of several a month, what with my being, since 1978, an academic in the Department of Art History at the University of Sydney, where, in our Department seminars, I have regularly heard, and continue to hear, presentations based in an idea of art as animation, using the terms and ideas of animation while addressing art, yet leaving animation itself unaddressed, uninterrogated, unacknowledged. Put simply, not only is ‘animation…for us film, and as well media, studies’ “blind spot”’(Cholodenko 2008, p. 12), animation is the ‘blind spot’ of art historians, and let me add, art writers, critics, theorists, etc., too. In fact, now at my Departmental art history seminars—and it’s become something of a joke!—colleagues wait with bated breath for me to raise the subject of animation, and thence to point out how its address and elaboration in the topic at hand would not only enrich the topic but would have the uncanny consequence of making art a form of animation. And a few of them seem grudgingly to agree with me, though I have yet to see tangible evidence in their presentations and publications! Nonetheless, I continue to press the point, as well as with my Institute’s guest lecturers, wherever it seems to press on me! Second—and here a brief professional bio to establish my bona fides—such a turn to art is a return to the field I went to graduate school to study after I gave Law away, though after a few years of art history, circumstances led me into Film Studies, and that led me to the University of Sydney in 1978 to create its Film Studies program. So this paper and project mark my return to art history, a field, it turns out, that never left me, has never not ghosted, spectred me, as I discovered when I went back to my writings on animation to see if I took up art in them, and if so, where. In fact, it’s there right from my first publication! Figure 1: J. Stuart Blackton, The Enchanted Drawing, 1900. Figure 2: Michelangelo, Creation of Adam, c. 1511-1512. The life of the object privileged by animation obviously includes the life of the art object, of whose enchanting, magical, seductive games, play (the ludic, meaning play, comes from the Latin ludere, which gives us the word illusion, as in ‘The Illusion of Life’), I wrote for the first of many times in note 23 of that Introduction, using Norman McLaren’s A Chairy Tale as example of the way the object, after Baudrillard, seduces the subject, animating and reanimating it, making the subject enter its realm of metamorphosis, even despite itself. Indeed, theorists as different as Henri Focillon in The Life of Forms in Art, Eisenstein in Eisenstein on Disney and Paul Barolsky in A Brief History of the Artist from God to Picasso all define art as metamorphosis, privileged figure and process of animation. In fact, Eisenstein explicitly visions drawing, poetry and animation as metamorphosis after Ovid’s Metamorphoses, as Barolsky does art, Barolsky treating as artists the Greek mythological figures Hephaestos, the forger of golden automata girls to serve him, Prometheus, who brings the spark of life to animate the clay human, and Pygmalion, who animates his sculpture Galatea through the intervention of Aphrodite, who breathes life into the sculpture. Barolsky’s treatment of these mythical figures as artists marks a telling intersection with my treatment of them as mythical animators in my ‘Speculations on the Animatic Automaton’! Here, let me first say, as I elaborate it in ‘The Illusion of the Beginning’: insofar as Mendelowitz endorses the assertion by The Encylopedia of World Art that ‘drawing is the basis of every pictorial experience, particularly that of painting’(Mendelowitz 1967, p. 8), he draws every pictorial experience into the aporia (that is, an irresolvable, logical contradiction, impasse, black hole) of drawing and of the beginning. Insofar as he declares, ‘History begins with drawing: man’s oldest records are on the walls and ceilings of certain caves in France and Spain’ (p. 33), he likewise draws history and records, indeed the record, into the aporia of drawing and of the beginning. Secondly, the aporia of drawing and of the beginning, of the origin, is the aporia of the Heideggerian riss. The riss is the tear, rent, cleft, fissure, gap, crack, flaw—the interval, the in between (the in between so ‘definitive’ for animation and its theorising, as Norman McLaren so compellingly insisted upon)—that is the ‘site’, the ‘place’ of ‘passage’, the trace/trait, of the simultaneous drawing forth and withdrawing, attracting and retracting, joining and separating, of and as drawing—drawing as delineation (drawing, sketch, outline—dessin) and as design (plan—dessein), and vice versa. Insofar as ‘this drawing is the riss’, it is the in between doubled, making for double trouble, reminding one of Jessica Rabbit’s ‘I’m not bad. I’m just drawn that way!’. If drawing is the basis of all arts, and drawing not only draws forth the riss but is the riss, then out of the aporetic, formless, plasmatic, graphematic, animatic riss of drawing comes all form, in the visual arts the 3D plastic as well as the 2D graphic, without the riss ever being given, nor capable of being given, as such. In other words, the riss is the blind spot of the blind spot, the blind spot that cannot be seen no matter what. The riss would be the essence, or rather, after Derrida, the ‘nonessence’—the nonessence of essence and essence of nonessence at the same time—of all art. All art as animation draws the riss—the interval, the interstice, the in between. The riss draws all art as animation. Drawing is the riss of riss, riss the drawing of drawing. Put otherwise, since 1) all art draws forth from drawing, from drawing as what I have called the graphematic; and 2) animation as what I have called the animatic is inextricably commingled with drawing as the graphematic—at once the drawing of animation and the animation of drawing, making it impossible to know where drawing ends and animation begins—all art draws forth from this graphematic animatic and animatic graphematic and is therefore never not not only drawing as the graphematic but also animation as the animatic, making it understandable that drawing is acknowledged as the ‘basis’ of not only all art but of animation, even if it is not understood that animation is the ‘basis’ of drawing, hence of all art. In other words, that writing on drawing I did was laying out the necessary condition of art as animation, that is, as the graphematic/animatic deconstructive drawing of drawing, as the drawing forth/withdrawing of delineation and design and at the same time the delineation and design of drawing forth/withdrawing. So while Donald Crafton declares, ‘Drawings that “come to life” may be said to be the great theme of all animation’ (Crafton 1979, p. 414), I would propose ‘Drawings that draw the riss are the great theme of all art’—and more than theme, as ‘idea, concept, process, performance, medium and milieu’ (Cholodenko 2007c, p. 67),and of images, objects and apparatuses, too—in other words of all art as animation, as endowing things with life and motion, with the qualifier of art as animatic as lifedeath, which means life can never be ‘come to’, no more than death, rather the deconstructive in between, the riss, of at once the life of death and the death of life. Put otherwise, the drawing of the ‘origin’ as riss—the drawing of its drawing forth/withdrawing—is the origin of drawing as ‘drawing’, where origin as drawn and the drawn as origin is ‘originarily’ lost as found and found as lost, disseminated, seduced, led astray, the fatality of originary deviation for Baudrillard. Intriguingly, in terms of Eisenstein on animism, in a section of Eisenstein on Disney less than a page in length—a section with which I think many of you would be familiar—Eisenstein defines the animated drawing as ‘the most direct manifestation of…animism! That which is known to be lifeless, a graphic drawing, is animated’ (Eisenstein 1988, p. 43). But this section is not about the animated drawing of animated film, it is about the stroke drawing of primordial and primitive cave art! In other words, and here I make this claim: the term ‘animated drawing’, used to refer to film animation not only by Eisenstein but Walt Disney in his Disneyland program The Story of the Animated Drawing (1955), harbours a secret: drawing is itself never not animated, line is never totally inanimate, a position perfectly understandable in terms of animism. In any case, that line has a life of its own is already marked in Eisenstein in his primordial and primitive plasmaticness as essence of drawing and of line, at once of animation and of art. The drawing of animation and animation of drawing marks movement as inhering in line for a number of artists. But that life as well as movement inheres in line is not so in evidence, the additions to Eisenstein I have so far located, in terms of explicit written comment, being Picasso, Braque, Hans Richter and Viking Eggeling. It is a point I am far from being the first to advance, though I am not sure it has ever been put quite this way before. But here I must make a parenthetical remark: the increasing tendency of animation scholars to treat animation as only involving movement and not life I find worrying, not least because it suggests that movement is increasingly gaining ground and life increasingly losing it, that life is increasingly only a matter of movement. But if either life (and/or death) is lost from the equation, animation is itself lost. And for me, insofar as life itself and death itself are today everywhere at stake, so too is animation. Insofar as animation itself is today everywhere at stake, so too are life and death. Never not articulating the animate upon the inanimate, life upon death, movement upon nonmovement, animation never not draws drawing, i.e. drawing as drawing forth/withdrawing, that is, draws death to life and life to death at the same time, as it simultaneously draws motionless into motion and motion into motionlessness. I would put it thus: even as (as I phrased it in my ‘Who Framed Roger Rabbit, or the Framing of Animation’, after Derrida) the frame frames—so the line ‘lines’, that is, at once de-lineates as it lineates and lineates as it de-lineates, including itself. The line is never not double, doubled and doubling. I call the life of line, the ‘life line’, if you will allow (which life, or better lifedeath, I elaborated in ‘Who Framed Roger Rabbit,…’ and ‘The Illusion of the Beginning:…’), virtual animation, the virtual as potentiality, to distinguish it from the virtual of virtual reality, which for me is the hypervirtual, the pure and empty form of the virtual, the pure and empty form of potentiality, a ‘virtual’ for me, arguably unfortunately, increasingly more actual than the actual, even as the actual is increasingly more virtual than the virtual. So, not only is art, i.e. the visual arts, a form of animation. All the arts, including theatre, dance, music, literature, etc., are forms of animation, which I hope explains what I am doing here on this panel on Theatre and Dance. And when I say ‘art’ here, I mean the elevated, ‘high’ Fine Arts as well as the ‘lowly’ popular arts. So, even in the necessary step of my looking back to see what I have already done, and reanimating it, and vice versa, this paper is a step forward in the development of that claim, including already offering you new readings, propositions, claims attendant upon it. It is an enormous, complex and variegated project I’ve embarked upon, with so many facets to be investigated, including not only the multifarious histories, theories and philosophies of art but cognate areas like the histories of art history, art theory, philosophies of art, aesthetics and art criticism. This obviously includes researching the ideas of artists, historians, critics and theorists, including in Film Studies and animation studies, particularly in the area of the treatment of the notion of the animator as artist, author and creator, including in the areas of ‘mainstream’ as well as Fine Arts animation, which, as we know, crosses over into avant-garde cinema. For me, the call for papers for this conference on The Animator links animation with art in general through the phrase ‘the role of the creator, the artist, the animator’, even as I linked the role of the animator with that of the author, and as well that of the creator, through the Latin auctor, meaning creator, in my essay ‘(The) Death (of) the Animator, or: the Felicity of Felix’, Part 2: ‘A Difficulty in the Path of Animation Studies’, published in Animation Studies. I knew ‘the author’ through the theory of the auteur in Film Studies, where it underwent massive critique. The auteur in Film Studies came from the model of the artist in ‘the modern system of fine arts’, as Larry Shiner calls it in his The Invention of Art, a system including art history. It is a model that has come down to us from the 18th century, but with roots in theology—the Judaeo-Christian God the model artist-author-creator-animator of all artists-authors-creators-animators—and therefore from myth before it, my abstract for the conference drawing upon my depiction and deconstruction of the authorial, ensouled/inspirited animator in my ‘(The) Death (of) the Animator, or: The Felicity of Felix’, Part 2. Put simply, the model that animation has of the animator as artist is the very model art history has of the artist as animator, with the animation part repressed but returning in those tell-tale ways in Fine Arts, including art history, as in all ‘disciplines’, those ways I mentioned at the beginning of this paper, which is what has so irritated and provoked me and which I seek to remedy. So the vision of the animator as total author-creator is a vision of the animator as total artist, pure origin, pure source, which is the modern vision of the artist period!, a vision at once of the animator as modern artist and of the modern artist as animator. Which allows me to bring, as a first step, to my art historian deniers of the artist as animator—as what I call the ‘artist-animator’—the animator as artist—as what I call the ‘animator-artist’. But you knew that already, right?! But the analyses and critiques of the author in literary studies (Michel Foucault’s ‘What is an Author?’ and Roland Barthes’ ‘The Death of the Author’, most especially) and philosophy (Derrida’s dissemination of presence, essence, identity, self-identity, etc.) that were imported into Film Studies would not be known in animation studies if literary studies, philosophy and Film Studies are ignored by animation scholars, short-changing animation studies and the understanding of animation thereby. For those in animation studies who take animation to be a form of film to then take Film Studies—its history and theorisings—to be irrelevant to animation studies makes no sense to me. And not just art as animation but artifice as a form of that in between and in betweener of all things I call the animatic. I want to take that Fine Arts aestheticisation of the animator as artist into a new place—well, an old place or two become ‘new’ again—by first returning to that mytho-theo-logical painting which offered to the modern system of Western art its very model of the artist-auteur-godly master-creator-animator of the universe and all within by spiralling right back to none other than Michelangelo’s Creation of Adam (see Figure 3), to the touch of God’s animating digitus spiritus, his finger of his right hand—that hand against which all handwork is measured (Barolsky 2014, p. 4), that finger according to St Augustine the Holy Spirit breathing life into Adam—and to the artist as divine animator in God’s likeness, wielding the drawing instrument (drawing forth breath, indeed anima, as not only breath but air, life, soul) as double of God’s animating digitus spiritus, and continue moonwalking from there, to Plato’s cave, to palaeolithic caves, and beyond. In other words, Part 2 beckons. Dr Alan Cholodenko is an Honorary Associate of the University of Sydney. Barolsky, P. (2010). A Brief History of the Artist from God to Picasso, The Pennsylvania State University Press, University Park, Pennsylvania. Baudrillard, J. (1997). ‘Objects, Images, and the Possibilities of Aesthetic Illusion’, in Jean Baudrillard, Art and Artefact, (ed.) N Zurbrugg, Sage Publications, London, in association with the Institute of Modern Art, Brisbane. Cholodenko, A. (1991a). Introduction, The Illusion of Life: Essays on Animation, (ed.) A Cholodenko, Power Publications in association with the Australian Film Commission, Sydney. Cholodenko, A. (1991b). ‘Who Framed Roger Rabbit, or The Framing of Animation’, The Illusion of Life: Essays on Animation, (ed.) A Cholodenko, Power Publications in association with the Australian Film Commission, Sydney. Cholodenko, A. (1997). ‘“OBJECTS IN MIRROR ARE CLOSER THAN THEY APPEAR”: The Virtual Reality of Jurassic Park and Jean Baudrillard’, Jean Baudrillard Art and Artefact, (ed.) N Zurbrugg, Sage Publications, London, in association with the Institute of Modern Art, Brisbane, reprinted in International Journal of Baudrillard Studies, vol. 2, no. 1, January 2005. Cholodenko, A. (2000). ‘The Illusion of the Beginning: A Theory of Drawing and Animation’, Afterimage, vol. 28, no. 1, July/August. Cholodenko, A. (2003). ‘Apocalyptic Animation: In the Wake of Hiroshima, Nagasaki, Godzilla and Baudrillard’, in Baudrillard West of the Dateline, (eds.) V Grace, H Worth and L Simmons, Dunmore Press, NZ. Cholodenko, A. (2004a). ‘“The Borders of Our Lives”: Frederick Wiseman, Jean Baudrillard and the Question of the Documentary’, International Journal of Baudrillard Studies, vol. 1, no. 2, July. Cholodenko, A. (2004b). ‘The Crypt, the Haunted House, of Cinema’, Cultural Studies Review, vol. 10, no. 2, September. Cholodenko, A. (2007a). ‘Animation—Film and Media Studies’ “Blind Spot”’, Society for Animation Studies Newsletter, vol. 20, no. 1. Cholodenko, A. (2007b). ‘(The) Death (of) the Animator, or: The Felicity of Felix’, Part 2: ‘A Difficulty in the Path of Animation Studies’, Animation Studies, vol. 2. Cholodenko, A. (2007c). Introduction to Cholodenko, A (ed), The Illusion of Life 2: More Essays on Animation, Power Publications, Sydney. Cholodenko, A. (2007d). ‘Speculations on the Animatic Automaton’, The Illusion of Life 2: More Essays on Animation, Power Publications, Sydney. Cholodenko, A. (2008). ‘Why Animation, Alan?’, Society for Animation Studies Newsletter, vol. 21, no. 1. Cholodenko, A. (2011). ‘(The) Death (of) the Animator, or: The Felicity of Felix’, Part 3: ‘Death and the Death of Death’, in Selected Writings From the UTS: Sydney International Animation Festival 2010 Symposium, (ed.) Chris Bowman, published by the Faculty of Design, Architecture & Building, University of Technology Sydney, Sydney, Australia, reprinted in International Journal of Baudrillard Studies, vol. 11, no. 1, January 2014. Cholodenko, A. (2014). ‘“First Principles” of Animation’, Animating Film Theory, (ed.) K Beckman, Duke University Press, 2014. Crafton, D. (1979). ‘Animation Iconography: The “Hand of the Artist”’, QRFS, Fall. Derrida, J. (1978). ‘The Retrait of Metaphor’, Enclitic, Vol. 2, no. 2 (Fall). Derrida, J. (1987).‘Cartouches’, The Truth in Painting, trans. Geoff Bennington and Ian McLeod, The University of Chicago Press, Chicago. Eisenstein, S. (1988). Eisenstein on Disney, trans. Alan Upchurch, Methuen, London. Focillon, H. (1992). The Life of Forms in Art, Zone Books, New York. Lacoue-Labarthe, P. (1989). ‘Typography’, Typography, (ed.) C Fynsk, Harvard University Press, Cambridge, Massachusetts. Leslie, E. (2002). 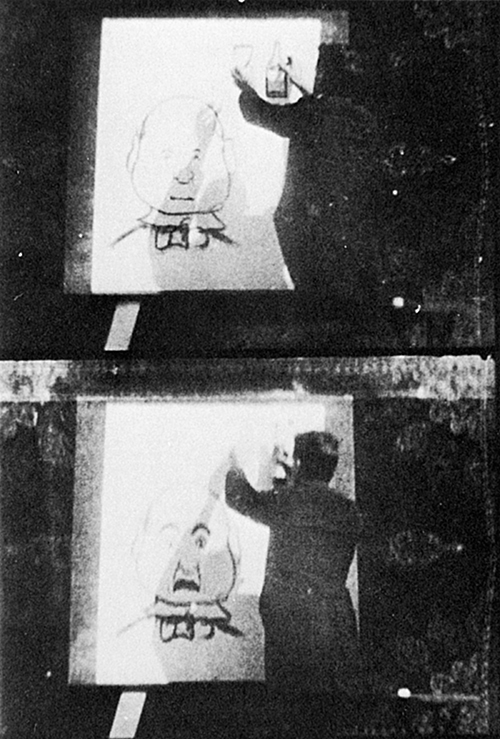 ‘Zero, Dots and Dashes: Drawing and the European Avant-Garde’, in Hollywood Flatlands: Animation, Critical Theory and the Avant-Garde, Verso, London. Mendelowitz, D.M. (1967). Drawing, Holt, Rinehart and Winston, Inc., New York. Papapetros, S. (2012). On the Animation of the Inorganic: Art, Architecture, and the Extension of Life, University of Chicago Press, Chicago. Shiner, L. (2001). The Invention of Art: A Cultural History, The University of Chicago Press, Chicago. Wells, P. (2009). The Animated Bestiary: Animals, Cartoons, and Culture, Rutgers University Press, New Brunswick. Worringer, W. (1927, 1957). Form in Gothic, Alec Tiranti, London. On Film Studies’ ‘blind spot’, consult too my ‘“First Principles” of Animation’, in Animating Film Theory, edited by Karen Beckman and published by Duke University Press in 2014. It is a short form of my keynote address at the SAS annual conference at RMIT in Melbourne in 2012. My consideration of art in terms of animation is a project already nascent in my asking a former student of mine, Catherine Lumby, to curate an art and animation exhibition she called Reanimators as part of my THE ILLUSION OF LIFE conference in 1988. Further, as I proposed in that note, for me there is a game being played out between the two-dimensional (the drawn caricatural, childish toons and objects of cartoon animation) and the three-dimensional (the ‘photographed’, live action human subject, as well as the three-dimensionality of adult, human character) ruling film from before its inception to today, one for me privileging the two-dimensional. Here I add: such privileging crosses paths with Jean Baudrillard’s theorising of art and the image, for whom the two-dimensional, the subtraction of a dimension from three-dimensional reality, is what inaugurates the power of illusion of the image. See his ‘Objects, Images, and the Possibilities of Aesthetic Illusion’, in Jean Baudrillard, Art and Artefact, ed. Nicholas Zurbrugg, Sage Publications, London, 1997, p. 9. In terms of that life, see my ‘“OBJECTS IN MIRROR ARE CLOSER THAN THEY APPEAR”: The Virtual Reality of Jurassic Park and Jean Baudrillard’, note 18 (note 19 in the reprint), where I reference Philippe Lacoue-Labarthe’s ‘Typography’, in which he relates Pierre Maxime Schuhl’s characterisation of what unsettles Plato in the plastic realm or in ‘fiction’, that is, the uncanny! As Lacoue-Labarthe declares of it: ‘This is mimesis, the “disquieting strangeness” of fiction: undecidability “itself”’’ (Lacoue-Labarthe 1989, p. 93, note 79). I also deploy this comment in ‘Speculations on the Animatic Automaton’, The Illusion of Life 2: More Essays on Animation, pp. 504-505. Not only does the uncanny form a part of my Cryptic Complex of animation as the animatic, insofar as all the arts are forms of animation for me, that Complex subtends and operates in all the arts. On that Complex, see my first proposing of it in ‘The Crypt, the Haunted House, of Cinema’, Cultural Studies Review, vol. 10, no. 2, September 2004, p. 107, to say nothing of my dozen plus subsequent essays elaborating it. As for the life, or better hyperlife, of the artist, see my references to Andy Warhol in ‘Apocalyptic Animation: In the Wake of Hiroshima, Nagasaki, Godzilla and Baudrillard’ and ‘“The Borders of Our Lives”: Frederick Wiseman, Jean Baudrillard and the Question of the Documentary’. A point I broached with Derrida and with which he concurred in a conversation we had during his visit to Sydney in August 1999. See Derrida, ‘The Retrait of Metaphor’, Enclitic, vol. 2, no. 2 (Fall 1978), pp. 27-33; and ‘Cartouches’, The Truth in Painting, p. 193. And for those who want to think of animation, or some form or mode of it, as itself by definition an art, if it is an art, it, like all arts, is a form of the animatic. And therefore the graphematic. Here a crucial, related point regarding the animatic life of images and objects, including art objects, be the objects organic or inorganic, and of theories of them. For me, such thinkers as Gilles Deleuze, Baudrillard, Derrida, Paul Virilio, etc., are animatic thinkers of not only animation but the animatic, including of the animatic life of the object: for example, Deleuze, of the inorganic life not only of objects in cinema but of cinema itself—cinema as ‘machinic assemblage’, as spiritual and material automaton; and Virilio, of a world reanimated by its objects and technologies of speed and war. Insofar as one of the major criticisms of structuralism was that it was unable to account for energy, movement, change, mutation, metamorphosis, etc., such ‘poststructuralist’ thinkers as Deleuze, Baudrillard, Derrida and Virilio mount a challenge to structuralism’s staticness, inertness, in a word inanimateness, with dynamic, vital, animate, animated—indeed animatic—modellings not only in their work but as (played out, performed by) their work. Part of this material on their theorising of the life of inorganic objects has already found its way into my publications. My thanks to Paul Wells for the reference to the Disney program in his The Animated Bestiary (p. 44). In this program Disney cites the animal tableaux in the caves at Lascaux as, states Wells, ‘the first example of humankind seeking to animate animal movement’ (p. 44). Disney’s is an insightful remark, an initial step down the road to my marking cave drawing, cave art, as not just aspiring to animation but itself animation, art animation (if not more—artifice, the animatic), thinkable (but too simply) in terms of anima/animal/animism, which matter I shall take up in Part 2 of this essay. For me, that plasmaticness, plasticity, what might otherwise be called ‘elasticity’, of animation operates necessarily even in the definition/defining of animation, making that definition itself plasmatic, plastic, elastic, itself operating subservient to and performing that for me nonessence of animation as the animatic. See Esther Leslie, ‘Zero, Dots and Dashes: Drawing and the European Avant-Garde’ in Hollywood Flatlands: Animation, Critical Theory and the Avant-Garde. For Richter’s comment on Eggeling and his coming to see their analytical drawings as ‘living beings’, see my ‘The Illusion of the Beginning’, p. 11. The writings of the Expressionists, Orphists, Vorticists, Italian Futurists and the Surrealists also immediately suggest themselves for close research in this regard. See my ‘(The) Death (of) the Animator, or: The Felicity of Felix’, Part 3: ‘Death and the Death of Death’. With the morphing of Baudrillardian second order reality into his third order hyperreality, as I also write in that essay and in so many others, animation passes beyond itself into its pure and empty form, morphing into hyperanimation, as life morphs into hyperlife, death into hyperdeath, the animatic into the hyperanimatic. At the time of presentation of this paper, art historians I had found calling for investigation were Wilhelm Worringer, with his two forms of animation in art objects, that of the realist organic line of Classical art and, for him the stronger, that of the abstract inorganic line of Northern Gothic ornament (Worringer the influence on Deleuze’s notion of the superior life of inorganic objects); and Henri Focillon, for whom ‘life itself…is essentially a creator of forms. Life is form…’ (Focillon 1992, p. 33), form, including plastic form, ‘has the motion and breath of life’ (Focillon 1992, p. 41) and art ‘is the perpetual renewal of Creation (Focillon 1992, p. 169). Also, at that point in time, the closest I had seen to an explicit statement that art is animation by a living art historian came from Spyros Papapetros, in his book On the Animation of the Inorganic (2012), where, in his attempt to locate the origins of what he calls ‘contemporary animated culture’, which is to say, one ‘increasingly possessed by the spirit of animation’ (p. vii), he inquires into ‘discourses of simulated movement and inorganic life that evolved from the analogously vivified terrain of the preceding fin de siècle’ (p. vii). These discourses are the theories of art of the leading German art historians at the turn of the 19th into the 20th century—again Wilhelm Worringer, as well as Aby Warburg and Alois Riegl—Worringer’s notion of ‘the uncanny pathos which attaches to the animation of the inorganic’ providing Papapetros with the title of his book, in which he extends those ‘historical theorizations of animation into early twentieth-century art and architectural avant-gardes: [Fernand] Léger, Mies van der Rohe, and [Salvador] Dali’ (p. xii). (Here I pause to express my appreciation to Papapetros for acknowledging my work in his book, even though that acknowledgment had to be cut to reduce the book’s length.) These art historians, as well as others I have discovered since the presentation of the paper and who likewise describe and/or inscribe and/or espouse art in some discernible and significant way as or akin to animation, will be engaged in subsequent parts of this paper. But one caution is already required: many of them seem to project the animation of the human subject onto the object, anthropomorphising it, rather than regard animation as inhering in the object, as the object having ‘a life of its own’, as possessed of, to use that buzz word of the last decades, ‘agency’, for me a synonym for animation, for the ability to animate. Such projection, anthropomorphising, is for me a way of short-changing not only the object but animation. Indeed, Shiner, in The Invention of Art, which I would call The Animation of Art, notes: ‘In studies of film as fine art, the ideal of the lone artist-genius led to a focus on the director as auteur’ (p. 287). See my ‘(The) Death (of) the Animator, or: The Felicity of Felix’, Part 2, for my at once positing and challenging the notion of the author as animator, indeed master animator. This entry was posted in Alan Cholodenko - The Animator as Artist, The Artist as Animator, Volume 10. Bookmark the permalink.